There’s nothing quite like being on the open water, just floating along. But this can be difficult with that little nine-foot jon boat that sits in your driveway ten months out of the year. 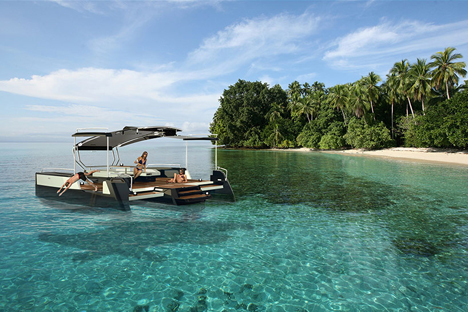 Austrian design studio formquadrat hope to enhance your boating experience. 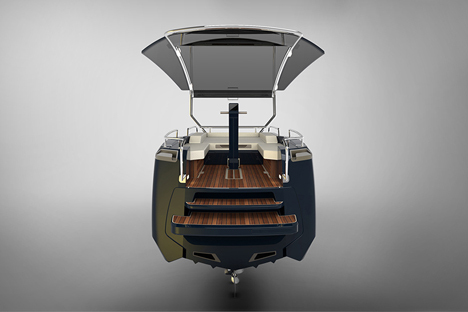 The ‘fines‘ is a “foldable multi-hull boat concept for 4-6 people,” meant to “create a mobile, individual oasis of well-being.” This comfort comes from the ability to leave behind crowded beaches but still have the space to relax and bask in the sun. The side platforms spread out to about a 23-foot width. 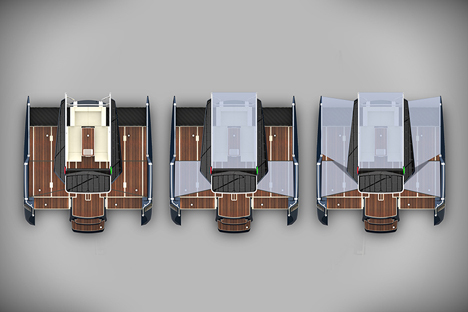 The front hull also extends to reveal a lounge area with a built-in dedicated grill for cooking. When the sun begins to set and it’s time to head back, the fines’ hulls lock together and the boat becomes 8.5 feet wide, just the right size to fit into the docks.